Seems like it was only a matter of time. Along with Apple and Google you can count Microsoft in into the car technology playing field. The Redmond, WA tech giant is working on its own version of Windows in the car. An early beta of the software, which it called the 'connected car concept', was demonstrated at the Build 2014 developer conference a few days ago. It became clear that the software is in its initial stages of development when it crashed halfway through the demo. 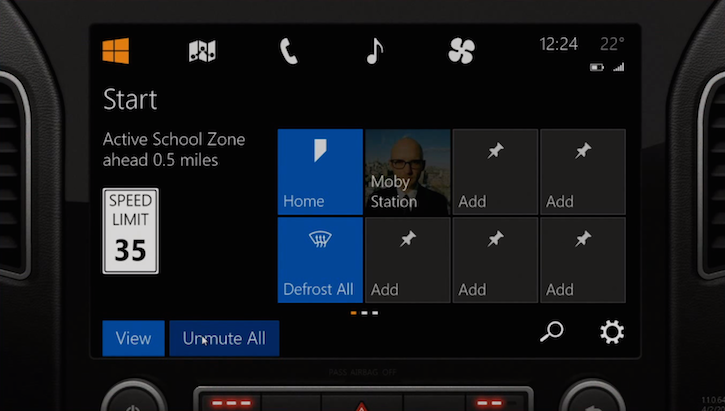 The concept puts Windows Phone software in the car's dashboard. Cortana, Microsoft's voice assistant, may well end up gracing the software at a later stage. The software puts commonly used smartphone functions in the car in a very windows-phone-esque user interface. With Windows in the car you will have access to your music library, navigation, phone call functions and even your car's insurance information.